An overhaul pack aimed to enhance the game as much as possible while still being faithful to the original Turok you know and love. 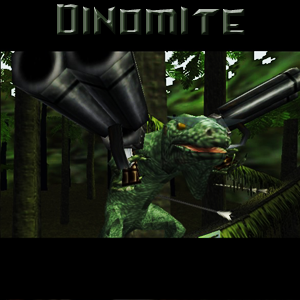 This is my contribution to the awesome Turok community, it's a culmination of all my work so far. I'm having a lot of fun and hope to introduce more in the future. All textures, sprites, and HUD elements have been enhanced using Artificial Intelligence/Machine Learning techniques. Restyled Logo for the main menu, somewhat inspired by the original N64 logo. Replaced loading screen with an HD version of the same art. Fonts have been cleaned up, new green font for the console. New green crosshair that is visible on every surface. Some minor translation issues fixed. Found German in the Italian translation for some reason. No time trial/tutorial text. Sounds still play though. I assume most people don't need tutorial text, and it blocks your view. Simplified and clarified menu and game text. Reworked the vanilla sounds for hopefully slightly better quality. Absolutely nothing that manages core gameplay has been touched! An alternative logo for the main menu, made from scratch in inkscape. An accessibility cursor and crosshair. Each mod is isolated by design so you can hand-pick a custom mod loadout or use them together for the ultimate TurokNG experience! Installation is easy, simply unzip the mods folder into your game directory. The Mega link has an invalid decryption key. Should be fixed now, I accidentally cut a single character off the end. Absolutely wonderful stuff here. I really appreciate that you split the assets into separate packs as well. This is a pack of optional mods that you can use in conjunction with TurokNG or with any other combination of mods.